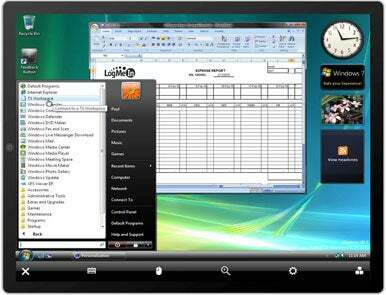 Remote desktop client LogMeIn Ignition, which allows users to remotely control a computer using iPhone OS devices, is due to receive an update that adds support for the iPad in conjunction with the device's launch on April 3. The new release of the product provides three significant enhancements; first of all, it fully supports the iPad, meaning that you will be able to take advantage of the latter's increased screen real estate for a more immersive remote control experience. Additionally, the app has been optimized to be compatible with both on-screen and hardware keyboards, thus making full-screen access to a remote computer possible even when you're typing. According to LogMeIn's VP of remote access products Andrew Burton, whom Macworld reached by telephone at the company's development labs in Hungary, a lot of work has also gone into optimizing the point-to-point technology that the app uses to render the captured screen of the computer it’s controlling, likely in recognition of the higher networking demands that the iPad's larger screen will require. In broad terms, LogMeIn Ignition could be an early example of the kind of revolutionary opportunities that the iPad brings to developers and users alike. While remote desktop sharing may be a convenience on a phone—something you use on-the-go when you absolutely need to perform a task on your computer—the iPad's larger real estate could finally make thin-client network computing an everyday reality. Thanks to apps like LogMeIn, leaving your computer at home altogether and then accessing it through the much more portable iPad while you're traveling is no longer a far-fetched idea. Granted, the iPad doesn't support a mouse, which the majority of laptop and desktop applications need to function well—but the remote control apps will overcome this obstacle as well. For example, LogMeIn Ignition supports the use of multi-touch gestures to simulate mouse activity on the host computer. The updated LogMeIn Ignition will be available through the App Store at launch on April 3 for $30 in a Universal binary that supports all three iPhone OS device classes (iPad, iPhone and iPod touch). Existing customers will be able to upgrade to the new version free of charge (and use it on their iPad as well). Update 2:17 PT: The new version of LogMeIn Ignition is now available in the App Store.